Just a hop-and-a-skip from Miami, Florida, a Bahamas honeymoon is among the most desired for newlyweds. A Bahamas honeymoon is a popular choice for newlyweds on the hunt for a tropical destination for their trip. With more than 700 islands and cays, couples have plenty of places to see and explore. 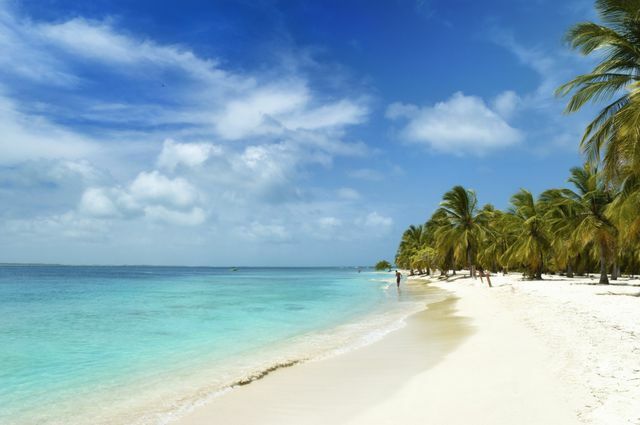 Especially for adventurous twosomes who prefer the waves over rolling hills or snowy mountaintops, this stretch in the Caribbean is renowned worldwide for scuba diving. Not only is it home to the infamous, oversized Andros Barrier Reef but also to Thunderball Grotto, which you might recognize from many James Bond movies. A Bahamas honeymoon will be filled with sunshine, beautiful beaches, and (most importantly!) lots of romance. Thanks to temperatures that can only be described as gorgeous, a Bahamas honeymoon is recommended in each and every month of the year. However, if you and your new forever partner want to avoid crowds and high prices, there are a few strategic considerations you can make. The most popular season is winter, when many Americans flee the frigid forecasts that threaten to cover them in snow. Another overcrowded time is during spring break - from March to mid-April - when a mix of high schoolers, college kids and families flock for a much-needed getaway. Luckily though, late April through December is just-about-perfect timing for your Bahamas honeymoon, with dependable sunny days and beautiful sunsets to kiss under. As an added bonus, Bahamian weather doesn’t run a high risk for hurricanes, since more tropical cyclones hit the shores of nearby United States than this Caribbean destination. Not too far from the island of New Providence, chances are high you’ve definitely heard of this region of the country. It’s known for countless white sandy beaches, especially Cabbage Beach and unsurprisingly, Paradise Beach, for which it’s named. Here is also where one of the most renowned and frequented properties for a Bahamas honeymoon is situated - the impressive Atlantis Resort. What makes this an easy-peasy starting point for newlyweds since two bridges connect it to the city of Nassau over the harbor. In addition to catching up on your beach reads, snuggling under a cabana or trying to count the cascade of stars in the sky, you can also spend your days snorkeling or testing out your bravery bones at the Aquaventure water park. Don’t miss this local dish: Conch, a traditional fish fry caught from the sea. Could also be a tomato-based chowder. Consider yourself warned: if you venture here for your Bahamas honeymoon, you need to be an all-out Disney fanatic. Though this private oasis was formerly referred to as Gorda Cay, the Walt Disney Company purchased it as the exclusive port for the Disney Cruise Line ships. If you adore Mickey, Minnie, the princesses and all of the characters, you can use Castaway Cay as a jumpstart to your honeymoon, as cruises debark at least once a week from this area. The perk of being part of the Disney experience is nearly every whim and need is catered to, giving you permission to sit back, relax and make magic with your lifelong partner. At Castaway Cay, you can lay in the sun, nom on tropical bites and get lost in one another while awaiting to take off on your journey. Don’t miss this local dish: Mickey Mouse ice cream and smoothies, of course! It is worth the Instagram, after all. Ask any native and they’ll be quick to tell you that while Blue Lagoon Island definitely attracts visitors, it’s also lovingly referred to as the ‘real’ Bahamas. How come? Even though it’s a mere three miles from Nassau, it’s always been a popular spot to disconnect and unwind, enjoying the laid back feel of the area. These days, it’s owned by a family who runs a business giving visitors the opportunity to have natural, in-the-wild encounters with dolphins and sea lions. After you’ve shared a kiss with the ocean (and your partner), head to the most beloved beach of the whole country - Salt Cay - with clear, blue waters and white sand. Cocktails, sunrises and sunsets abound, making for uber romantic memories and experiences… especially built for two! Don’t miss this local dish: Johnnycakes, which will probably remind you of cornbread, but serves as the bread of the country. You’ll find these with stews and curries!